Will they all install scrubbers? 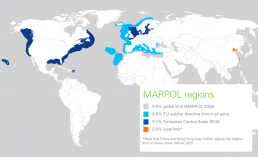 IMO MARPOL 2020 sets new global limits for sulphur emissions and sulphur content in marine fuels. From the previous 3.5% maximum, shipowners now face a global 0.5% limit in addition to the 0.1% limit in current emission control areas. To comply with the regulations, one will either have to install a scrubber or buy expensive Very Low Sulphur Fuel Oils (VLSFO). In this article we show that a scrubber is the way to go. The IMO MARPOL Annex IV defines a 0.50% sulphur limit for marine fuels in use on ships operating outside sulphur emissions control areas (ECA). The rule comes into force from January 1st, 2020. This covers all fuel oils used by ships outside the existing ECA for SOx emissions which are the Baltic, North Sea, North America & US Caribbean for which limit remains at the level at 0.10% max sulphur. A recent, significant amendment to the regulation is the agreement on a carriage ban for high-sulphur fuel oil (HSFO), except for ships equipped with scrubbers. The decision enables authorities to check and detain ships carrying non-compliant fuel without having to determine if it has been used or not. It is not known exactly what the premium will be to buy Very Low Sulphur Fuel Oils (VLSFO, 0.5%) or Ultra Low Sulphur Fuel Oils (ULSFO, 0.1%). It has been predicted that only a small percentage of ships will manage to get scrubbers installed by the deadline 2020, therefore a massive change in the global fuel market is to be expected from January 2020 when the majority of ships globally will have to change from IFO to VLSFO or ULSFO. Today the VLSFO is about 35% more expensive than say IFO380. If the price premium for compliant fuel increases, as can be expected, we should see payback times for scrubber installations dropping well below one year. Even with today’s price spread, the payback time is barely above one year. Sufficient to say, scrubber installations are very profitable. Installation of scrubbers may be considered a technical risk, adding complexity to the ship’s systems. This is correct, and for this reason, simple, robust designs should be preferred above the complex. The alternative solution of changing to compliant fuel is not risk free either. There is the obvious and very high commercial risk of future fuel prices and availability. Furthermore, there are technical risks as well. Distillate fuels, MGO, have very different viscosities, and more novel fuel blends do not yet have a track record. The fuel quality standard, ISO 8217, is expected to be revised to accommodate the new fuel blends, but probably not until 2022. Scrubber technology is not something new. It is proven technology and well documented. Experienced companies can engineer systems to meet performance requirements. One issue, when installing on a ship, is that the requirement changes with the area the ship operates. The 0.5% requirement is global. The 0.1% requirement applies to ECA zones like EU. Furthermore, there is the ban on liquid discharge in some ports. Let’s start by considering the open loop operation first, as it is the most simple, and most cost effective operation. In this mode the flue gas is simply sprayed with seawater which is used only once, hence the term open loop, as it really is no loop at all. In open loop mode the scrubber will absorb SOx in seawater. SOx is acidic and seawater contains some alkalinity. Provided that we use sufficient amounts of water, the spent liquid may be discharged directly to the sea. The requirement is that pH > 6.5 and that the depth of discharge is >4m. When the ship operates in waters where salinity is low, like freshwater or brackish waters, some caustic agent may be added to the loop. This is typically termed caustic assisted scrubbing or hybrid mode. The hybrid mode is much like the open loop mode, with the exception that some source of alkalinity is added to the liquid to assist scrubbing performance and ensure compliance. Closed loop mode differs from the two other modes in several ways. As the name implies, the circulation loop is closed and scrubber liquid is reused. The scrubber liquid will absorb heat from the flue gas. To avoid excessive temperatures the liquid is cooled with seawater, indirectly, in a heat exchanger. During closed loop operation, no liquid is discharged to sea directly. Zero liquid discharge is a requirement in certain ports. The Liquid is kept in buffer tanks. When the ship moved to a zone where discharge is allowed, the water may be discharged after some physical treatment (filtering). To comply with the IMO Marpol 2020 regulations one will need to follow either MEPC.259(68), Scheme A or Scheme B. Most (all?) scrubber vendors follow scheme B for which the requirement is to install continuous measurements of SO2 and CO2 in off-gas and pH, PAH and turbidity for liquid discharge. Seawater is excellent for scrubbing SOx, and open loop scrubbing should be the obvious choice for the vast majority of ships. Reaching the 0.1% is possible even when running 3.5% fuels, provided that a well engineered scrubber is installed. Hybrid and closed loop means more running costs and operational costs and should be employed only when required.